Disappointments come to everyone. They come in all sizes. Some are temporary and can be fixed. Others are like scary storms that shake us up but eventually pass. And then there are tsunamis. When A Tsunami Comes was written from the heart of someone struck by a tsunami. Members of the Esh family and several friends were on their way to a wedding when a tractor trailer smashed into their van, snatching the lives of ten occupants and the truck driver. Only two young boys survived. The journey to healing is long, winding, and torturous. Along the way, the Esh family found that God is faithful and good. 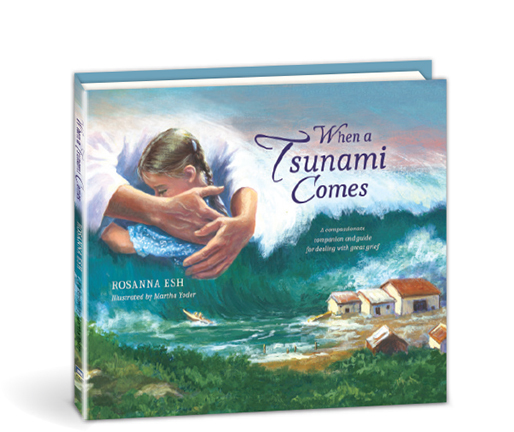 With expressive paintings and simple language for young and old, When A Tsunami Comes grieves with the grieving while pointing to the God of all comfort.